Revel in me...: Wrist junk. I grow up wearing a watch and to be honest, I can't imagine leaving home without wearing one. If I accidentally forgot to wear mine, I will feel like something is missing. 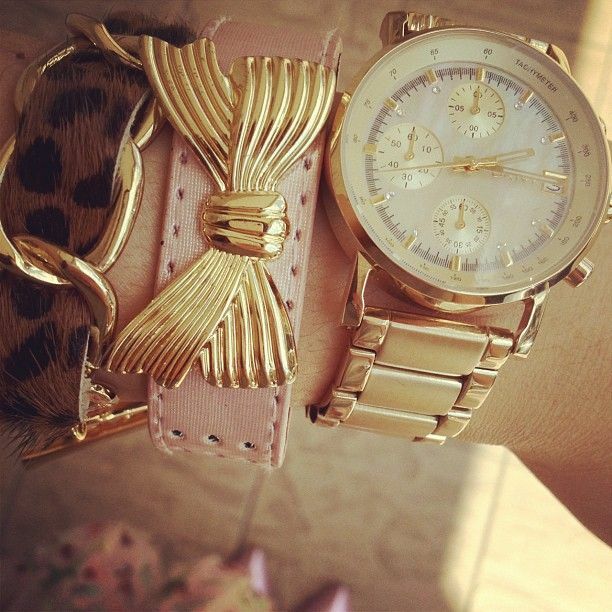 I love watches and I too am quite obsessed with gold watches (wearing one right now too :p). Btw, I am a right handed who wears my watch on my left hand. haha such a random post and question really! anyways, i'm similar to you in the sense i wear my watch on my dominant hand! and people give me glares for that wtf. Right handed - and i am used to wearing watches but can do without as well. But lately I have been wanting to get a watch, have not seen any that's "waving at me and shout take me home" watch. I'm a left handed and I always wear accessories and watch (if I have one soon) on my left hand. I don't know why I do not like to wear anything on my right hand hahaha! Yeah it interrupt when I type or write. So I only wear on days when I know I will not be writing or typing LOL! i depend on my watch a lot especially when im doing lab work. handphone is a little troublesome cos you need to press the home button in order for the screen to lit. so yeah, watch is faster. and i wear it on the left hand! right hander i am. i just don't likey it when im writing and my watch or bangles hit against the table. Im right-handed, and i wear my watch on my left hand. i only take off my watch when i shower, bath, swim, anything water related. I cannot leave my house without my watch. I will feel lost and uneasy somehow. I can use my mobile but it's just not the same! I've been wearing a watch since I started working because as a journalist, I am always pressing for time. I do check the time on my phone but sometimes I use my phone as a recorder so luckily I wear a watch! :D I wear it on my left hand as I am right handed. My logic? It's so that I don't scratch the strap when I write WTF and that I can write and hold up my left hand at the same time to tell time!